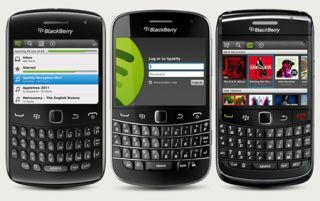 Spotify app now available for BlackBerry mobiles | What Hi-Fi? Spotify has now officially released its BlackBerry app which is now available to any user with a compatible phone. All owners have to do is point the web browser on their BlackBerry phone to m.spotify.com and follow the installation instructions. Compatible BlackBerry phones include the Bold 9780, Bold 9700, Curve 9300, Bold 9000 and Curve 8520. Currently the app only supports models running on GSM networks; CDMA-network phones and the Torch 9800 are not compatible. As with all Spotify's mobile apps, you'll need a Premium subscription to stream tracks to your BlackBerry.